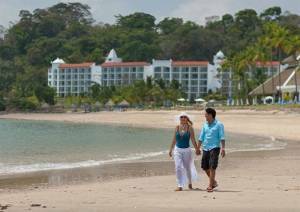 The Playa Bonita Panama Resort and Spa is coming to the gorgeous golden beaches of Playa Bonita, Panama. This 306 room resort boasts five sparkling free form pools, jungle walkways, ocean view suites, and an expansive, tranquil spa. While basking in tropical paradise, you will be just minutes from the colonial and shopping districts of Panama City, the Panama Canal, and the Punta Bruja Nature Reserve. This oceanfront resort will offer all the benefits of the Unlimited Luxury experience amid nature filled, magnificent surroundings. 4 Bars Serve Delectable Top-Shelf Spirits Including A Beach, Sports And Lobby Bar.